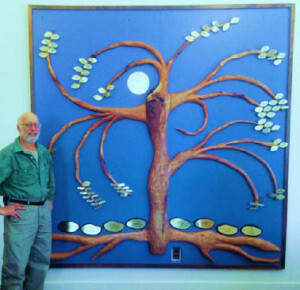 Our new Tree of Life was made by Robert Bergman to honor Pearl and Amos Turk and was donated by their family. At Congregation B’nai Israel, we value the opportunity to be involved in the significant events in your life and the life of your family. With the guidance of our rabbi, the arrival of your new baby will be celebrated with tradition, spirituality and care. Rabbi Altenburger will help you contact a suitable mohel for the technical aspect of the brit milah and will work with you to bring to life this tradition. Baby naming ceremonies for newborn girls consist of creative rituals, poetry and personal reflections, centered in the needs of your family. Both the ceremony of brit milah and the baby naming can be held in your choice of location: our synagogue, your home or another place. Both girls and boys are educated through our Hebrew School program, for at least 2 years before the beginning of the preparation for their special day. The specific study begins in the year before the date of their Bat or Bar Mitzvah. The family meets with the rabbi to go over issues and concerns important to the life of the young teen. While each ceremony is done with respect for the abilities of the individual child, many of our students are able to conduct sizable parts of the service. Some opt for parts of Torah reading, the reading and discussion of the weekly Torah portion and most will do haftarah (reading of the Prophets). Most attendees are amazed at the Hebrew skills of our students, as well as their personal reflections on the meaning of their readings. Adult Bar and Bat Mitvahs can also be facilitated. Rabbi Altenburger will be happy to discuss with you the process of joining the Jewish people. Study will be supplemented by independent readings and community observance and participation. Ceremonies can take place in our synagogue or the rabbi can be engaged to perform your wedding at a location of your choice. Please call Rabbi Altenburger at (203) 792-6161 for more information. Our cemetery on Miry Brook Road near the Danbury Airport has been in existence since the late 1800’s. Gravesites are available for purchase and funeral services, including pre-planning and counseling, are lovingly and caringly provided by our rabbi. Many have remarked at the rabbi’s most comforting and helpful commitment to Jewish ritual and family needs at this most difficult time. Our community comes together for all your needs regarding shiva.